Outboard Hydro Foils increase the power and stability of your outboard / z-drive, while reducing fuel consumption. The foils are simply mounted directly above the outboard. For outboards and Z-drives with an output of 40 hp and more. €84.95 Incl. tax, excl. shipping. Outboard Hydro Foils increase the power and stability of your outboard / z-drive, while reducing fuel consumption. The foils are simply mounted directly above the outboard. For outboards and Z-drives with an output of 40 hp and more. Dimensions: 430 x 410 mm. 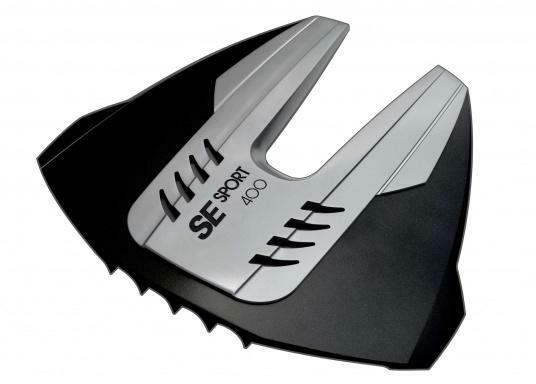 The big advantage: Thanks to the supplied mounting kit, the SESport 400 can be clamped to the cavitation plate of the outboard, which means that drilling isn't necessary. The foil can also be drilled if prefered. Habe die Tragfläche an einem 60PS Suzuki montiert kombiniert mit einem 4,50m Aluboot(Gewicht ca. 350kg). Die Maximalgeschwindigkeit red. sich um 1kmh. Ist nicht dramatisch. Die Manövrierbarkeit verbessert sich bei hohen Geschwindigkeiten merklich und der Bug geht bei langsamer Fahrt nicht mehr so hoch. Da gleitet es besser. Insgesamt steigt leider der Benzinverbrauch etwas an. Also der Zweck wird erfüllt mit kleinen Kritikpunkten. Produkt kam sehr schnell und unversehrt an. Montage und Test erst im April. Prima Shop, nur zu empfehlen.